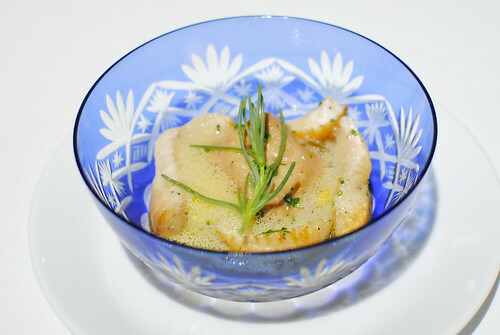 June 30 was the last day to legally serve foie gras in California (although some loopholes do exist). Melisse has been at the forefront against the ban and, combined with the fact that it’s one of the best restaurants in the city, I thought it would be the ideal spot to do a ‘last meal’ of sorts. 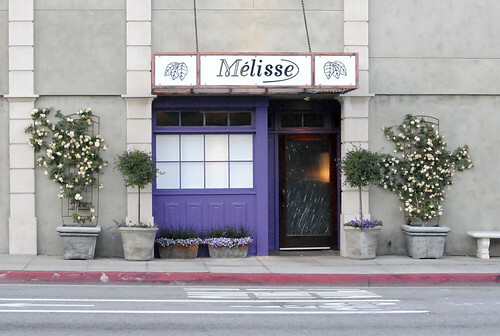 For a number of months now, Melisse has been offering a “Foie for All” tasting menu featuring the ingredient in about 8 courses. Knowing that others would likely follow suit (and indeed, it did appear to be a full house), I made this reservation in the beginning of April and eagerly awaited this dinner. 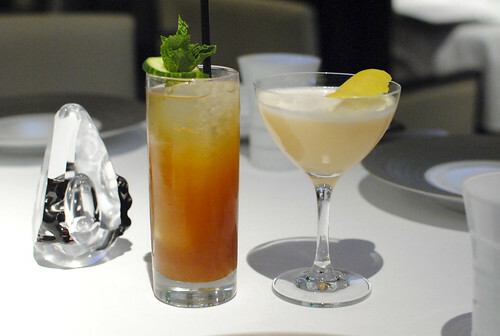 We ordered a few drinks to start (pictured from left to right, top to bottom). We previewed the new cocktail menu (consulted on by Pablo Moix) at the 5×5 Collaborative Dinner in April, so it was interesting to see the final list here. 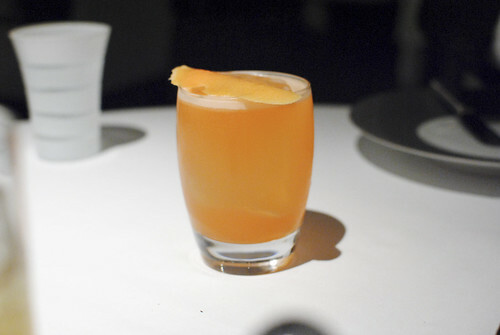 My favorite of these was probably the Citrine with its grapefruit/lime flavors balancing out the aperol nicely. The Pimm’s Rickey tasted slightly watered down. 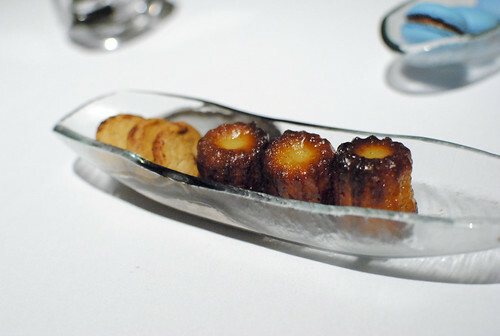 We began with Melisse’s signature amuse. The juicy sliced grape, covered in a thin layer of goat cheese and pistachio, was a well-balanced bite – sweet, savory, nutty. 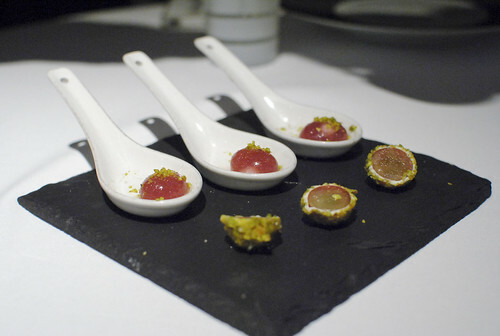 The spherification of grape juice provided the same flavors, albeit in a very different vehicle. 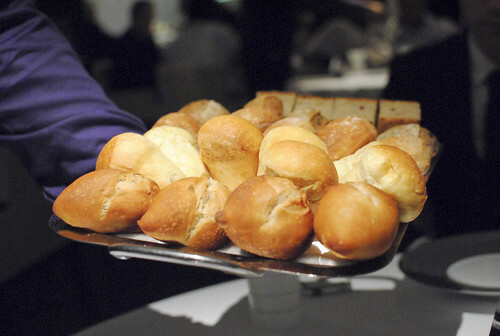 Bacon bread, olive bread, ciabatta, brioche and french breads were on offer this night. My first serving was of the latter two. Next up was another small bite, our first of foie gras. 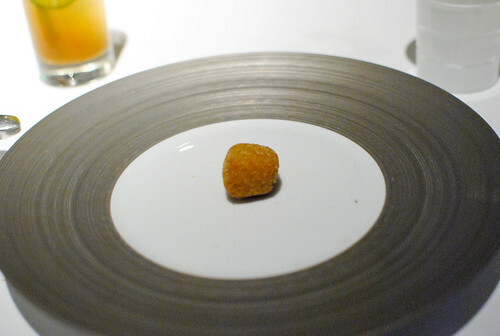 It was a crispy croquette filled with a warm foie gras liquid. 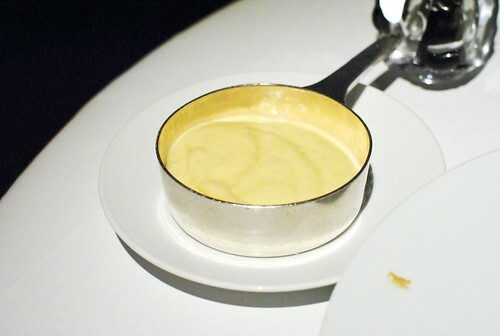 Warm and comforting, it was very similar to the one I had at the LudoBites foie gras dinner. 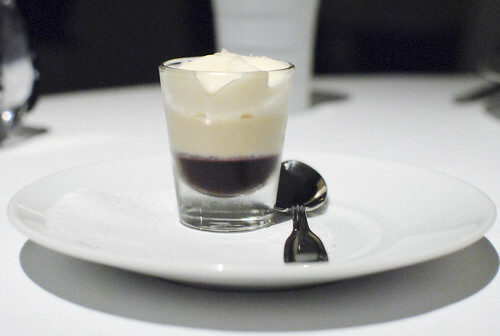 Next we had a layered treat with blackberry, foie gras and buttermilk. We were instructed to get a little bit of each layer in every bite and were awarded with sweet notes from the blackberry complementing the foie gras mousse. Subtle but present flavors. I really enjoyed this terrine with its creamy foie gras and a layer of sweet cherry. While the flavors were ones I’ve had before, they really seemed to shine on this plate. I liked being able to add my own salt & pepper to taste, as well as the nuts for texture. These were all spread onto the toasted bread to make some tasty bites. The pasta was very nice with a slight chew and creamy foie gras center. 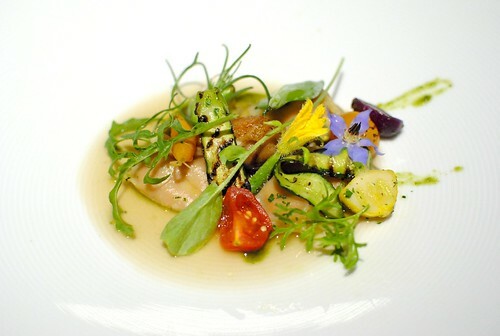 The broth had a subtle nuttiness, and the grilled summer vegetables were a nice accompaniment. 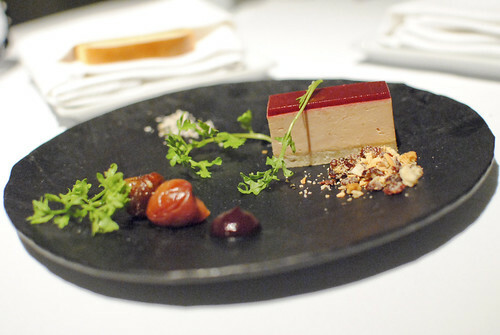 Even with the foie gras, this plate managed to feel rather light and really showcased the season. Beautiful colors too. 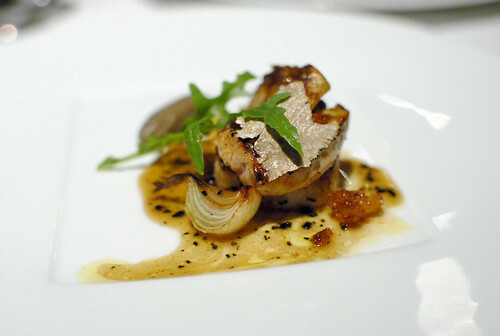 Scallops, foie gras, and black truffles sounded like a dream team on a plate. While the combination of components was good, I don’t think they all came together in the ideal way. The scallop was on the smaller side and was slightly overcooked, while the one sliver of shaved truffle got lost in the mix. 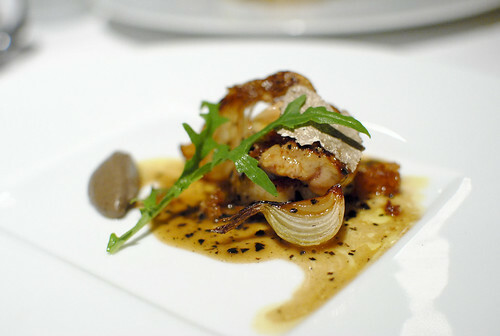 Still, the foie gras was seared perfectly and I liked the charred cipollini onions; the truffle and leek puree was a nice accompaniment too. This was an excellent dish with a sweet corn pudding being topped with a light sole and poached foie gras in a brown butter sauce. The flavors were well-balanced and really worked well, but I found the textural interplay to be strong too between the silky foie gras, meaty fish and creamy corn pudding. Our last savory dish of the evening was a duo of duck, if you will. The duck breast was cooked a nice medium-rare, juicy and tender. Small bites of duck confit, hearts of palm and the creamy mashed potatoes were all excellent. 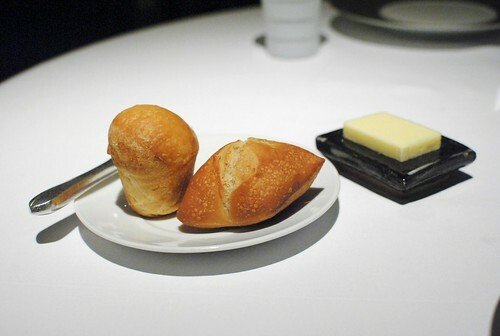 The difference-maker was the foie gras though. It was whipped and frozen in a long tube form, and grated like truffles onto the plate. Pretty cool. The liver slowly melted when in contact with the heat of the duck and sauce, permeating the dish with its flavor. Again, I enjoyed the side of salt and pepper to play with the seasoning. 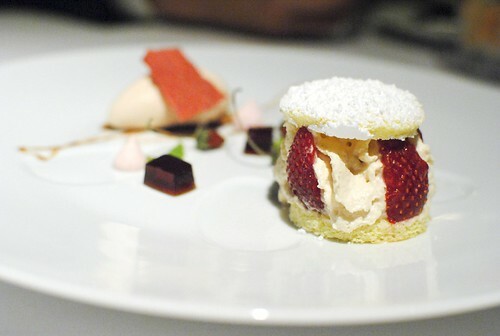 Our last proper course was a play on strawberry shortcake. Two layers of thin cake sandwiched a foie gras cream and fresh sweet strawberries. 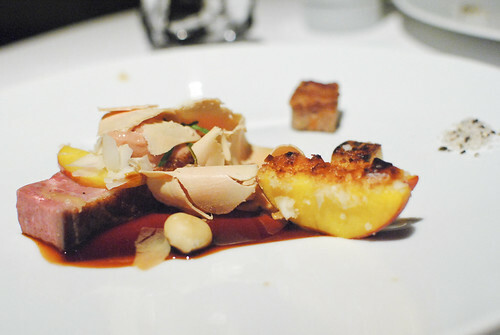 The foie gras was present but not at all overpowering, blending seamlessly into the dish. The foie gras ice cream was very subtle in flavor; balsamic vinegar gelee provided sharp acidity. Lastly, we were presented with some sweets to close out the meal. My favorite was the tropical tea macaron, exuding a flavor similar to a passion fruit iced tea with a perfect chewy texture. 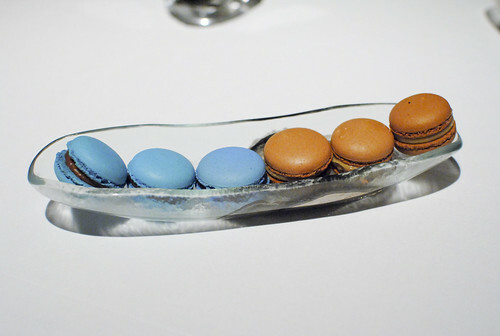 The foie gras macarons were a nice touch too, indeed bringing the foie flavor one more time. Overall I found this to be another good meal at Melisse. While we had 9 different tastes of the ingredient, at no point did I feel tired of foie gras, a compliment to the varied preparations. The liver was incorporated in a way that it didn’t dominate any single dish; rather, it was worked into each plate in tandem with the other principal ingredients. Flavors were, for the most part, bold and well-balanced and the execution was also strong (though not perfect). I suspect foie gras won’t be too difficult to obtain in California even though the ban is now in place, but I still found this to be a very fitting send-off! I really enjoyed the meal. Perfect foie dinner for a last hurrah. I’m surprised you liked the sole so much, as I found it to be my least favorite course in the menu. The foie just seemed superfluous in the dish. Ah too bad. I did enjoy that course quite a bit! So, how long do you give it until the banned is overturned? Maybe a year? I’m sure we’ll still get our fill somehow..